Sales on Alibaba's platforms had raced to a billion dollars in under five minutes and within the first 60 minutes had passed $5 billion. 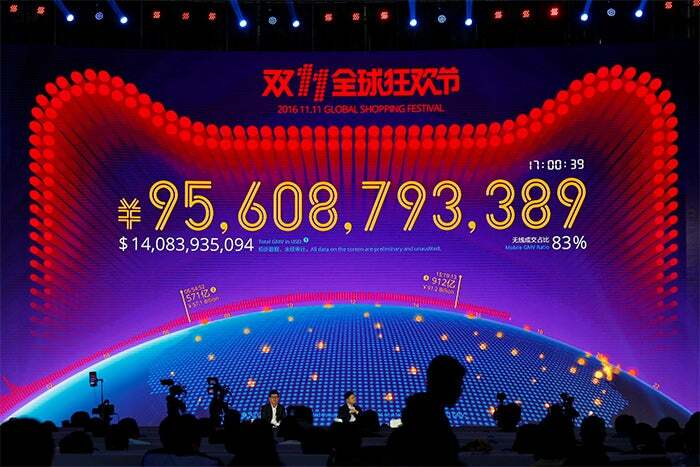 Alibaba Group Holding Ltd.'s Singles' Day sales surged past last year's 91.2 billion yuan ($13.36 billion) total with nearly nine hours left on the clock, but growth was markedly slower than in 2015 as shoppers sought even bigger price cuts. Amid fanfare and celebrity razzmatazz, sales on Alibaba's platforms had raced to a billion dollars in under five minutes and within the first 60 minutes had passed $5 billion -- a third faster than 2015 as the ecommerce giant looked to shrug off a domestic economic slowdown and a U.S. accounting probe. The 24-hour event held annually on Nov. 11 offers a benchmark for Alibaba's performance and an insight into China's swing to online shopping, especially via smartphones. Launched in 2009, Alibaba's version of the event was designed to encourage consumers without a partner to treat themselves. Sales growth was down from last year's 60 percent amid a more saturated domestic online retail market, a weaker economy and sluggish personal income growth. A strong U.S. dollar also hit the headline sales figure in dollar terms. The discount shopping day, also known as "Double 11," still shifts more goods than Black Friday and Cyber Monday in the United States combined. Sales on Alibaba platforms, including Tmall and Taobao, are tipped to exceed $20 billion this year. After a beefed-up marketing push over the last month -- with fashion shows and virtual reality games -- sales officially opened at midnight, releasing a wave of pre-orders that shoppers had placed ahead of the event. Sports stars David Beckham and Kobe Bryant attended the countdown, though headline act Katy Perry pulled out last minute citing a "family" issue. At 15:19 p.m. (07:19 GMT) a live sales tracker at Alibaba's main event in the southern Chinese city of Shenzhen passed the 2015 yuan total, ensuring the day will set a new record but, in dollar terms, was still short of 2015's $14.3 billion. The rise of Singles' Day reflects how China's consumers, armed with smartphones, are racing online to shop -- to the detriment of bricks and mortar stores. So far on Friday, 83 percent of sales were via mobile devices, up strongly from last year, Alibaba said. In May this year, Alibaba said the U.S. Securities and Exchange Commission (SEC) was looking into how it reports its Single's Day figures. Alibaba said at the time it was cooperating with the authorities, and that the SEC advised it the investigation should not be seen as an indication the company had violated federal securities laws. Alibaba declined to comment on the SEC probe on Friday. Alibaba is not the only retailer to mark Nov. 11 with a massive sales drive. China's number-two ecommerce player JD.com Inc. and many others also offer discount deals on the day.